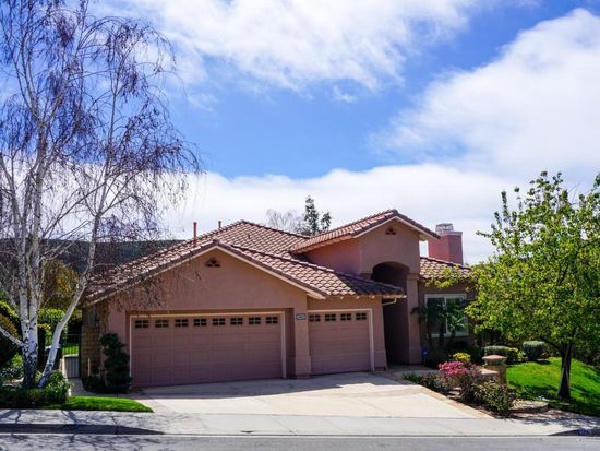 Beautiful home in highly desired Lang Ranch. Four bedrooms and 2.5 bathrooms plus an office with custom lighting above crown molding that wraps around entire ceiling. There is also a laundry room with washer and very high end dryer. Hardwood and tile flooring throughout the house with carpeted stairs leading to upstairs bedroom. Very large living room with built in entertainment center. There are two large fireplaces. Walk-in closet in master bath. The home is accented with crown moldings and plantation shutters and has very high ceilings. The kitchen has upgraded counters and a built in refrigerator. Large, white bookshelves with built in lights line the hallway. The upstairs loft was converted to the fourth bedroom with large deck. Gorgeous mountain views from upstairs. Large private back yard with patio and huge grass lawn surrounded by beautiful landscaping. Very spacious side yards. Walking distance to nearby park, hiking and biking trails. There is a half garage for storage in addition to the two car garage. A lot of storage cabinets in the garage.